Friday, February 1 is Free Food For Thought Friday at MPA! This is a wonderful opportunity for students who normally don’t take hot lunch or who haven’t for a while, to try MPA’s program. A MESSAGE FROM SAGE: SAGE is excited to partner with Mounds Park Academy for this fun event! Come and enjoy lunch on us! We know you’ll love the selections we have to offer. That day features a crowd favorite—house-baked chicken tenders, quesadillas, and brown sugar sweet potatoes. You’ll also find a build-your-own California Cobb salad, creamy baked mac and cheese, fresh baked chocolate chip cookies, and much more. Our team will be proud to serve you. Come and experience the passion and care that goes into every meal we create here at Mounds Park Academy! If your student likes what they have, Middle and Upper School students can add lunch for the remainder of the school year for $430—equivalent to just $5.75 per day. 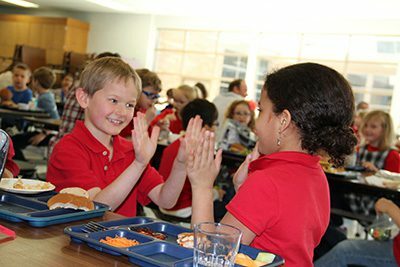 Lower School students can add lunch for the remainder of the school year for $380—equivalent to just $5 per day. Contact Amanda Platson, student billing coordinator, at aplatson@moundsparkacademy.org or 651-748-5502 to do so. Full allergy information and the menu may always be found at moundsparkacademy.org > current families > under all school resources. And the Touch of Sage mobile app is available for iOS or for Android where you can rate the lunches and provide real-time feedback. No sign up is required for Friday. Students may just help themselves to lunch and give it some thought!